…But not in Adelboden as the Guides of Epping bravely wade to the woodcarvers! The hills were alive briefly after the visit to Our Chalet and those famous Epping lungs were put into action as they ran down the grassy banks of the 1st world guiding Centre. 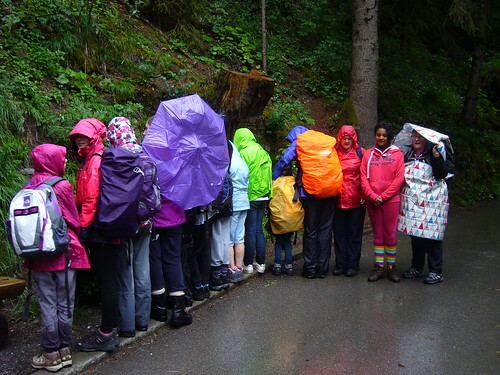 Lunch was unceremoniously taken in a bus shelter due to just unfairly horrific rain but we hung on to the smaller guides to prevent them being washed away and fought bravely on. We were rewarded with a spectacular treat in the Cholorenschlucht George which some of the girls enjoyed so much they climbed twice! The way the waters have carved their way into the hill side is really very stunning. A reward and a chance to dry off came in the welcome form of a hot chocolate at Café Blatti! Then, on to the Trummers and many of the girls learned about how wood carvings are made with a demonstration from Karl Trummer and his father Robert. Inspired, some of the guides even bought their own wood carving kits to give it a go themselves. So souvenirs and presents bought, time for a muddy walk down to George number two ‘Pochtenkessel’, smaller than the first but still very pretty. Cake as we waited for the bus was a fab end to the day! Quote of the Day: “Oh, that’s Edelweiss” Hannah remarked at seeing the flower she had previously thought was cheese! Local flavour: Lemon cake at Café Blatti! New Word: Regenbogen = Rainbow (we tried to create our own to remind God not to drown us!- see photo) or maybe just Regen = Rain!! Fashion: Janice made a fabulous Nurse like outfit from two union flag picnic blankets- practical and fashionable, not to say patriotic!